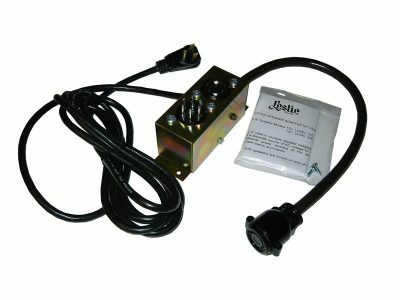 This adapter will allow you to connect an additional Leslie speaker of the same type to your installation. The adapter provides remote “Turn On” of the Leslies and A.C. power to the Leslies. This adapter must be plugged into a 120VAC outlet. This adapter will work with all standard 6 pin Leslies from either the 122 family or the 147 family. You must not use Leslies from the 122 and 147 families together with this adapter or serious damage will occur to your Leslies. The Leslie 122 family types are models 21, 22, 32, 122A, 122, 142, 222, and 242. The Leslie 147 family types are models 44W, 45, 46, 47, 145, 147A, 147, 245, and 247.